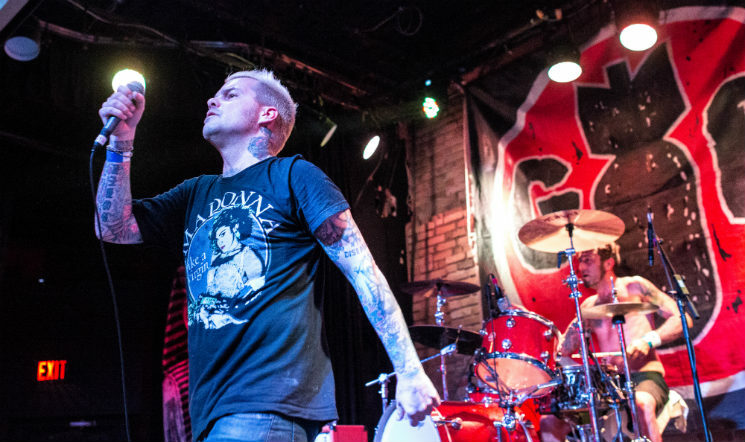 Good Riddance proved that they still play faster and louder than a lot of bands half their age when they hit the stage in front of a sold out crowd at the Pyramid Cabaret last night (October 24). And like most punk vets, they still mostly give the crowd the old classics that they came for, with a couple of newer tunes thrown in for good measure. The band opened with "Weight of the World" off 1996's A Comprehensive Guide to Moderne Rebellion and then played "Disputatio" from 2015's Peace In Our Time, never really taking much of a breather during the hour or so that they were onstage. While they maybe weren't as agile as they would have been in the '90s, Good Riddance were still energetic and had big smiles on their faces throughout. They also sounded great, and despite a broke guitar string during the encore, they really never missed a beat. The crowd was just as energetic, clapping along even near the end of the night when they launched into "Pisces/Almost Home." Cuts like "Fertile Fields" and "Steps" got the crowd pumped too, but if there's one song that really defined their performance, it was "Libertine." Seeing vocalist Russ Rankin and the rest of the band still up there shouting "The music somehow seems to get me by" was inspiring, proving that punk rock is definitely not just a phase to the Pyramid patrons. Opening duties went to Off With Their Heads, who made their triumphant return to the city after being turned away at the border in 2012. The quartet specialize in sloppy, self-deprecating punk, and they played a good mix from all three full-length records to a smaller crowd of dedicated fans, everything from "I Am You" to "The Eyes of Death" and "Nightlife," the latter of which was the first song to get the pit moving. As always, the band closed with "Clear the Air," and vocalist/guitarist Ryan Young really got into the performance. First, he literally jumped into the crowd and got smothered by a bunch of people who were shouting along; then, he crawled back up onstage, where he basically just laid on the ground and sang the rest of the song, summing up the mood of the track. Edmonton's Fire Next Time scored the first slot for a portion of this tour, and while they definitely aren't quite as awesome as New York's Iron Chic (a fact that the band were actually willing to admit onstage in between songs), they were still pretty good for what they were and played an enjoyable set. The folk-punk group just released a new record called Cold Hands in May, so it's fitting that they kicked off the set with tunes like "Hellfire & Damnation" and "Red Lion Rampant." Vocalist/acoustic guitarist James Renton has a great voice and the rest of the band sounded just as good. After seeing the guys play to almost nobody at the Zoo back in May, they proved that they are definitely capable of entertaining a crowd, and they did as much last night.